The owners & associates at In His Name Catholic Store are committed to bringing to our customers the best religious products to be found on the world market, at the fairest price and with the highest level of customer service & satisfaction. In this small way we minister to the people, parishes and churches of our true love - Our Lord Jesus. In 1991, the North Carolina Catholic population was less than 1 percent of the total population of the state. Raleigh, NC and the surrounding areas did not have access to Catholic merchandise except if a parish had a small shop. With the influx of more Catholics migrating from the north it became evident there was a need for such materials. In November of that year a Catholic store opened in a remote section of Raleigh in an 800 square foot facility. Marguerite Gibbons agreed to manage the business and began her career as a merchandiser of all things Catholic. Having always been involved in church life, she received support and encouragement from many of her close friends and fellow Catholics, not only as customers, but also as volunteer employees, cabinet makers, painters etc. Marguerite spent a great deal of time at the public library seeking suppliers, researching books, and learning all she could to make the venture a success and succeed it did! In 1993, three significant opportunities occurred. Mrs. Gibbons had the opportunity to purchase the business. The State of North Carolina advised her that the location she was occupying was to be razed to make way for a new Highway. 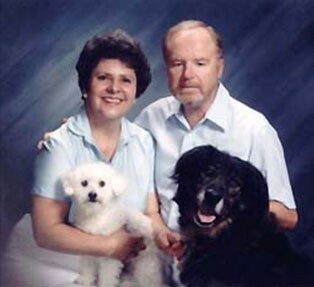 And her husband, Tom Sr. retired from industry and joined the company. The store was renamed, incorporated, and became "In His Name, Inc." Then came a move to 1600 square foot facilities in a more central location between three churches. In 1998 In His Name.com was born. It was one of the earliest online Catholic stores on the internet. By 2001, the store again had growing pains and was relocated within the same shopping mall to a 3400 square foot facility. Along with the above physical growth was the need to track sales, inventory, purchasing etc. This was accomplished with both computer, hardware and software installation (including the usual hiccups). Fortunately, God blessed us with very bright children and grandchildren. Our son, Tom Jr., an employee of a hi-tech computer company moved to Raleigh and was instrumental in our successful application of a computer system which now has a database of over 65,000 products. In addition, he and his sister Marguerite (now president of our corporation and fulltime employee) got our website up and running which has steadily grown and has allowed us to reach others in North Carolina (and elsewhere) not able to visit our store in north Raleigh. In 2012, we expanded to our new almost 6000 sq. ft location at 5300 Atlantic Ave, in Raleigh, NC to better serve all of our customers. Our new space gives us not only a well functioning store front but warehouse and processing facilities we needed to provide better fulfillment to our parishes and web customers. In addition, we have an 3 offsite stores, located at Annunciation School in Havelock, NC, Our Lady of Perpetual Help in Rocky Mount, NC, and St. Mary Catholic Church in Laurinburg, NC which gives us exposure to customers who cannot travel to Raleigh for their Catholic supplies. We are currently serving over 100 parishes & missions in our diocese and a number of churches (many non-Catholic) outside the Diocese and the state. In order to better serve our parishes we now publish our own 600+ page church goods catalog with some of our fellow members of National Church Goods Association. Our Motto: We do what we do "In HIS Name." Thank You for shopping with us at In His Name! God's blessings to you and yours!